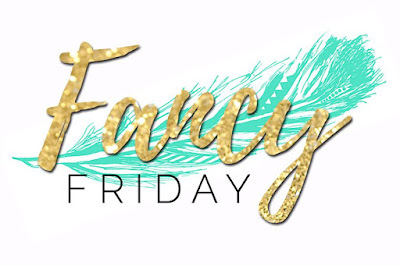 Welcome to December's Fancy Friday Blog Hop. Did you just visit with Paula? 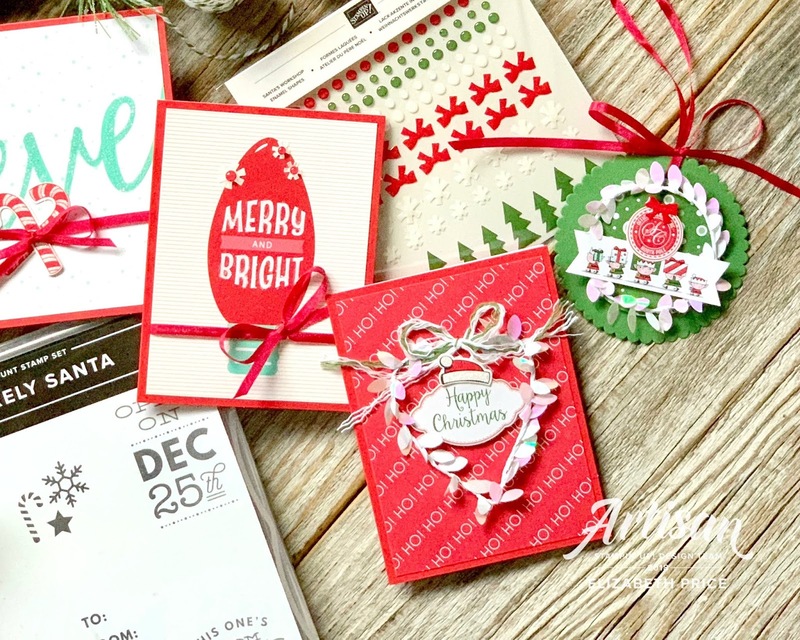 Her stampin' skills always inspire me and I'll bet you admire her style too. 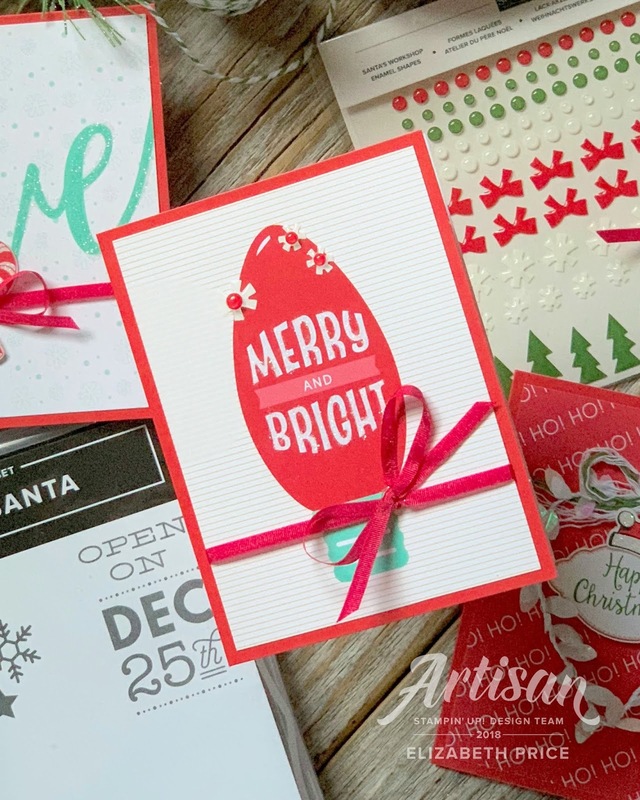 For this month we are double stampin' to be ready with handmade cards in our stashes to send out. Plus the challenge is to create with products from the 2019 Occasions Catalog. 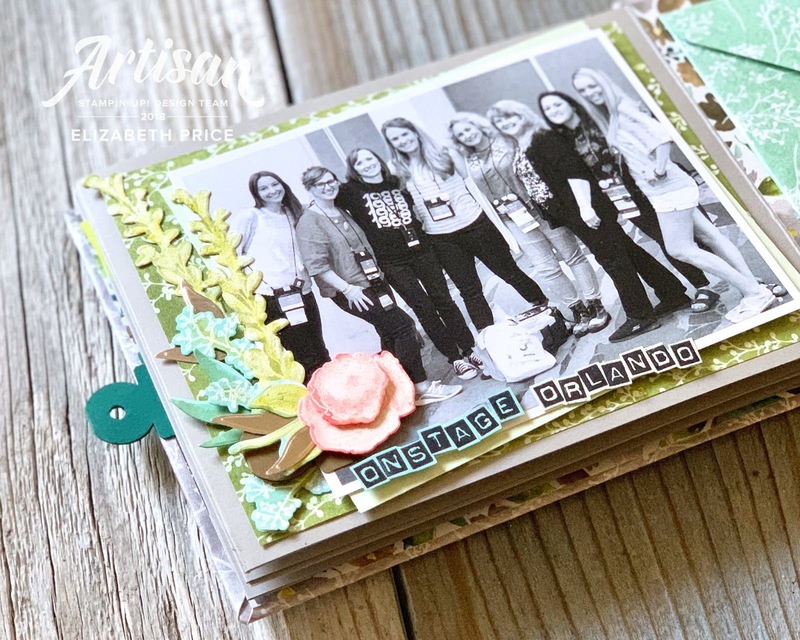 I spent a bit of time today crafting with the Floral Romance Suite on pages 10 and 11. The pieces included in the Wonderful Floral Framelits are GORGEOUS, intricate, versatile, and offer such elegance. The Soft Seafoam lattice boarder on the left of my first card was cut with one of the dies from the set. In fact everything was cut with pieces from the dies with the exception of the word "friend." 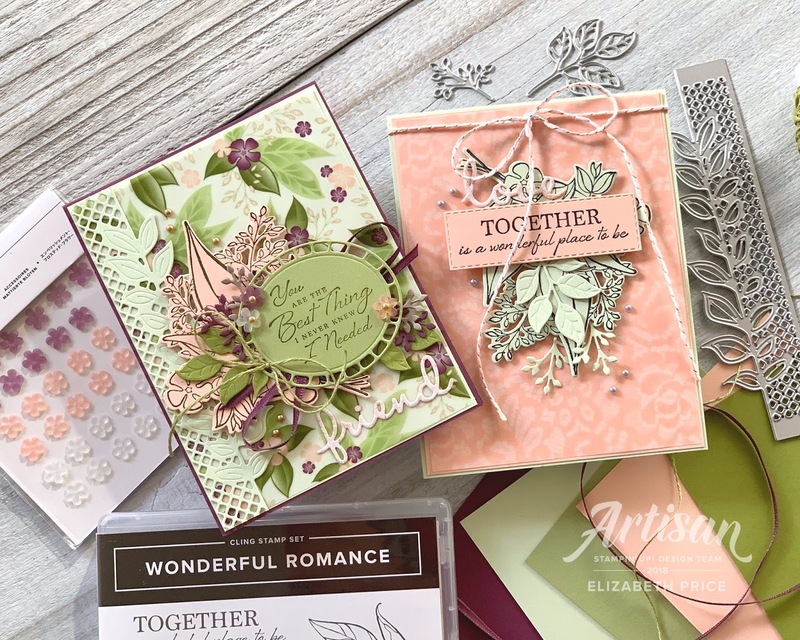 There is a VERY cool set of dies new in the Occasions Catalog called Well Written and they are such a delight to have in my stack of tools. 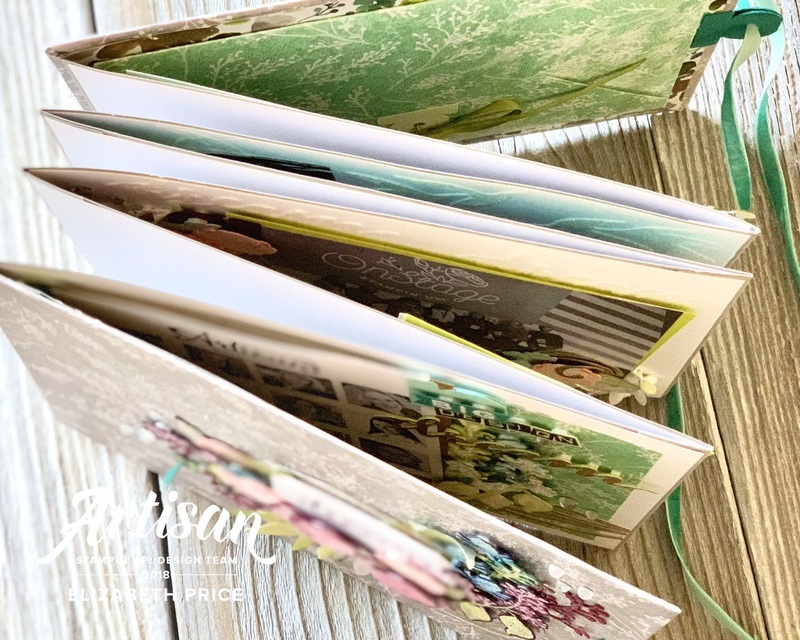 The stunning background paper is actually vellum and it comes from the Floral Romance Specialty Pack of DSP. I have layered it on a piece of Soft Seafoam Cardstock. To adhere the vellum I added a tiny amount of glue behind the darker flowers. This perfectly hides the adhesive and lends to a much tidier finished look. My second card is ready for the next wedding announcement that comes my way. 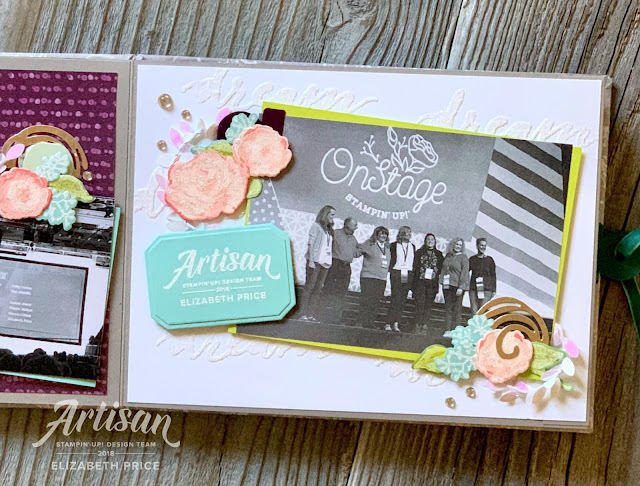 I have used the same elements as my first card along with another "must have" new tool. The Rectangle Stitched Framelit Dies are a stampers dream come true. I love how you can easily frame a greeting and the added stitching is awesome. Both cards included a die cut word from the Well Written Framelit Dies. Each is cut from Sparkle Glimmer Paper and then pounced with a Petal Pink Ink Pad. The hardest thing was the dot on top of the "i" in friend. With the help of my Take Your Pick Tool I tackled and conquered that dumb dot. 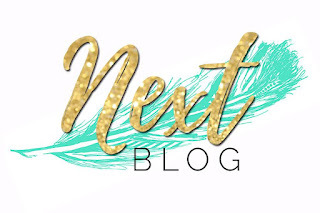 Your next stop will take you to see what Charlet Mallett has created for the hop. Everything she makes is so stylish and clever. Thanks for stopping by today. So much to do and time is running out. 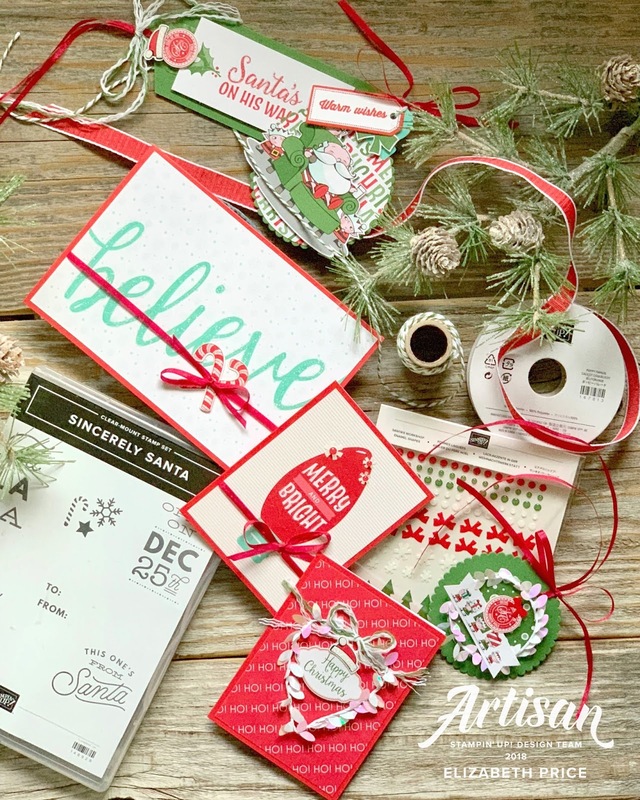 Thanks to all the many cool Stampin' Up! products I can whip up a little something cute to hold gift cards and a bite or two of something sweet. 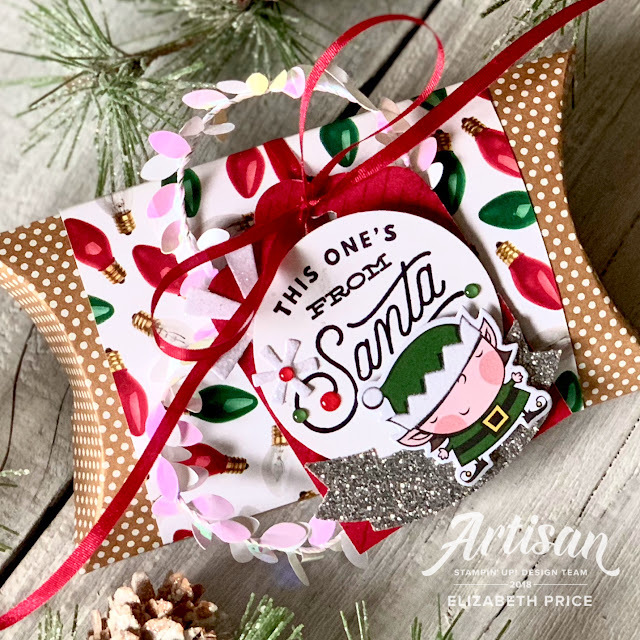 If you check out our latest challenge at #TGIF191 you will see stocking stuffer and neighbor gift ideas. We are just in time for those last minute details and wrapping it all up for the big day. The polka dot pillow boxes are a cinch to decorate and should be in every stampers stash of ready made products. 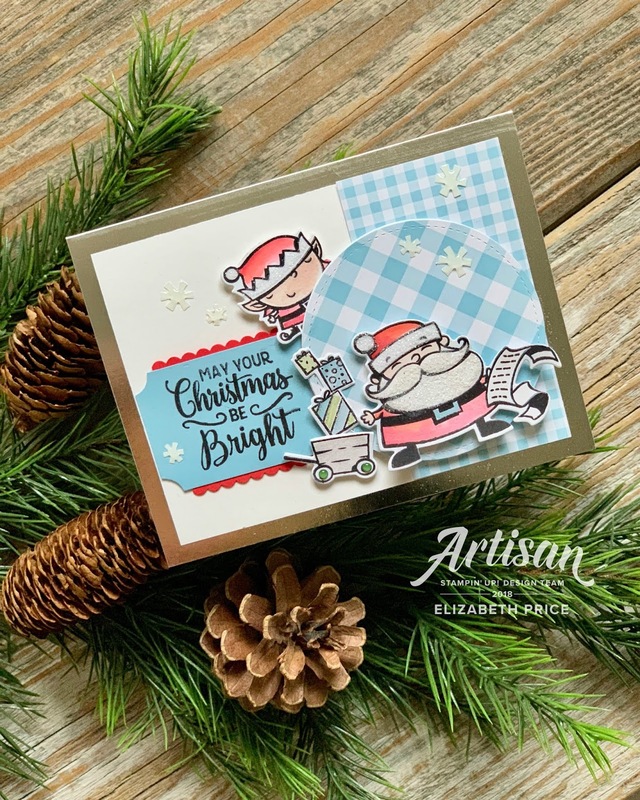 I have added a band of All is Bright DSP and added a fancy bitty tag to give a whole lot of presence to this gift card present. A bit of stamping with the greeting from the Sincerely Santa Stamp Set and a die cut elf from the Signs of Santa DSP make this tag quite adorable. I think the few added bits of signature sparkle make it extra fancy. And what takes it over the top are the loops of Iridescent Boxwood Wreaths. For this hop I have created an accordion style mini-album filled with gorgeous embellishments from the Frosted Floral Suite. I have included a repetition of elements and techniques to provide continuity through the book and beautiful details. This is a little something pretty for me to cherish a pretty amazing year. 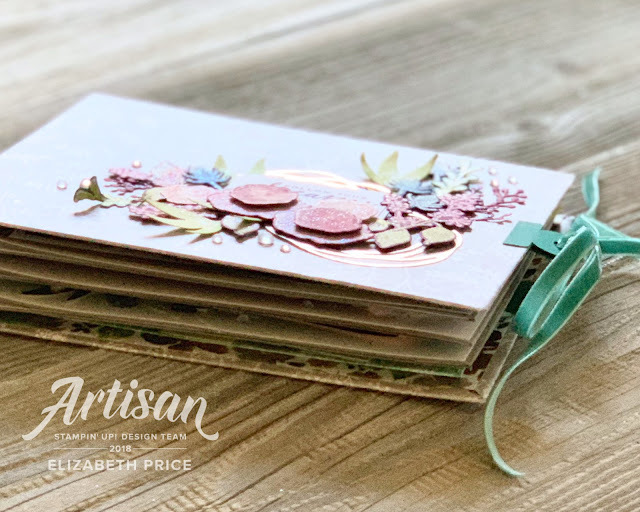 To start I wrapped 8" x 6" chipboard rectangles with shimmery Frosted Floral DSP and added in cardstock pages to match. Both the front and back covers include envelope pockets to hold more photos and memorabilia. A gorgeous Tranquil Tide 1/4" Velvet Ribbon tie holds it all together and lends to all the rich texture that fills the pages of the album. 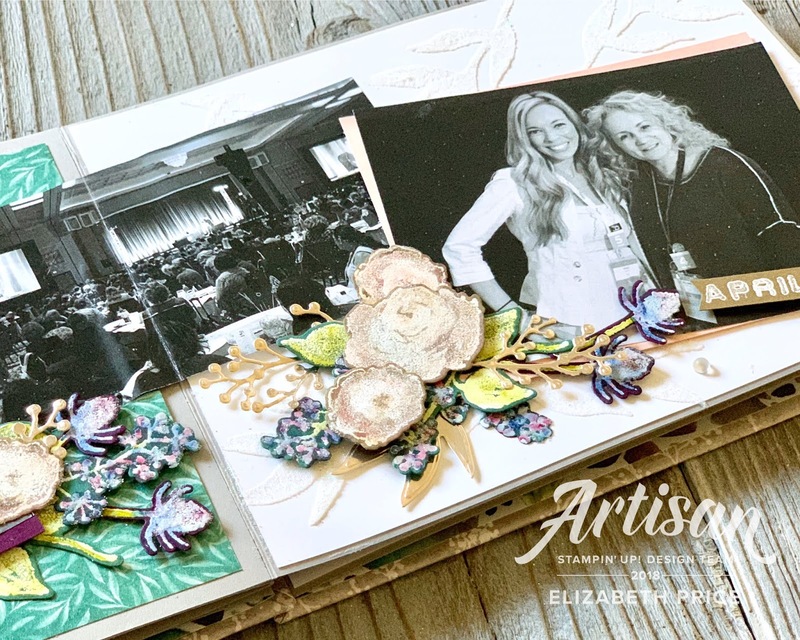 Each page spread includes Champagne Foil accents cut with either the Frosted Bouquet Framelits or the Swirly Scribbles Thinlits. I found these where the perfect way to set the stage for the stamped focal floral embellishments. I used the same technique for all the floral stamping. 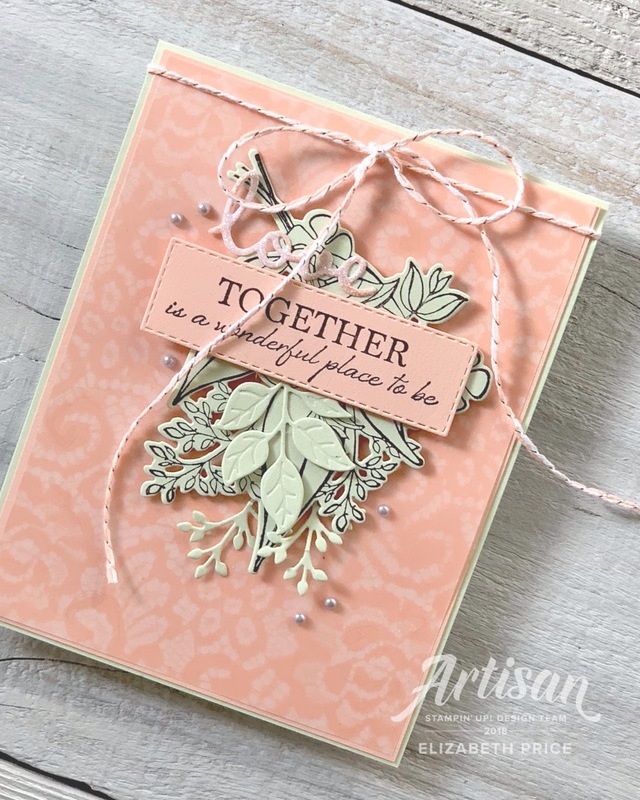 I stamped on colored cardstock with Whisper White Ink and then heat embossed each with White Embossing Powder. 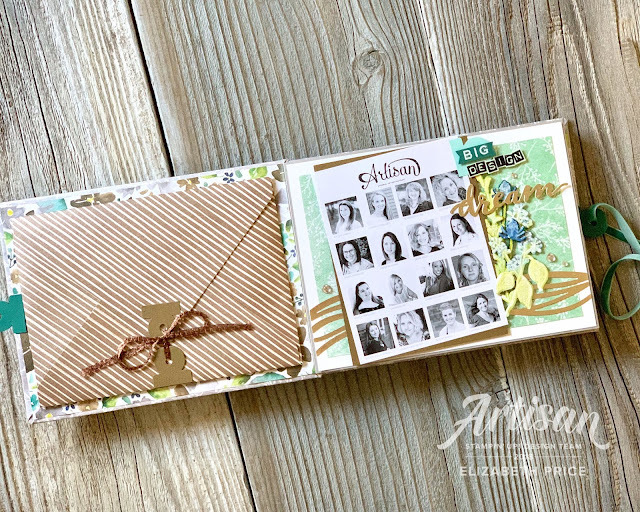 With an array of coordinating Stampin' Blends I colored directly over the white embossed images. 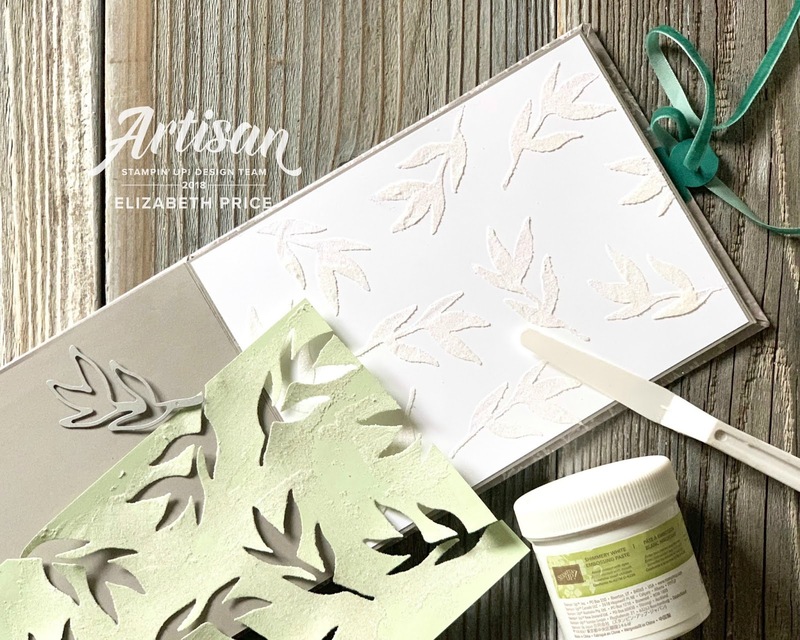 I made my own stencils to add texture to a few of the pages with Shimmering Embossing Paste. I wish you could see these pages in person as the paste is stunning. It's something I'm going to do more in the future. This last picture included in the album was taken of the Artisans who attended Onstage in Orlando. 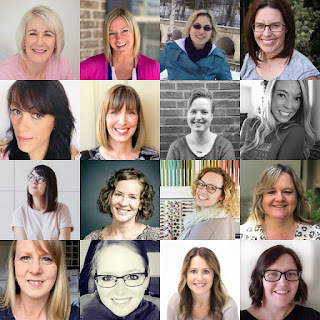 How I wish the picture included all 16 members of the team! What a blast it was to meet in person with friends I had been working together online for the past year. 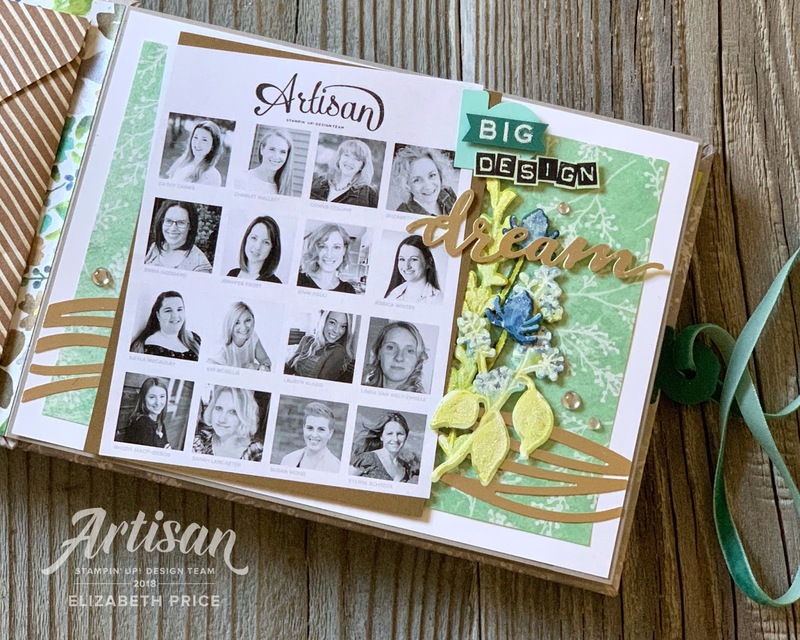 Photoed from left to right: Rhoda McPherson, Jenni Pauli, Cindy Schuster, Charlet Mallett, me, Connie Collins, Cathy Caines, and Lauren Alarid. Maybe someday I will get to stamp in the same room with Emma Goddard, Jessica Winter, Linda van Wely, Kayla MacAulay, Kim McGillis, Sarah Lancaster, Sylwia Schreck, and our FANTASTIC leader Susan Wong. 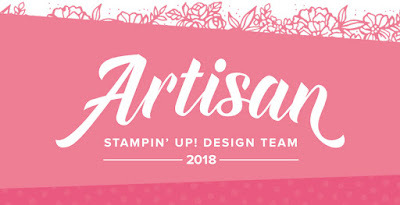 I'll close this post by saying that this has been a true joy and honor to have stamped with fifteen Artisans from around the world on behalf of Stampin' Up!. I thank the team for their friendship, encouragement, and inspiration. 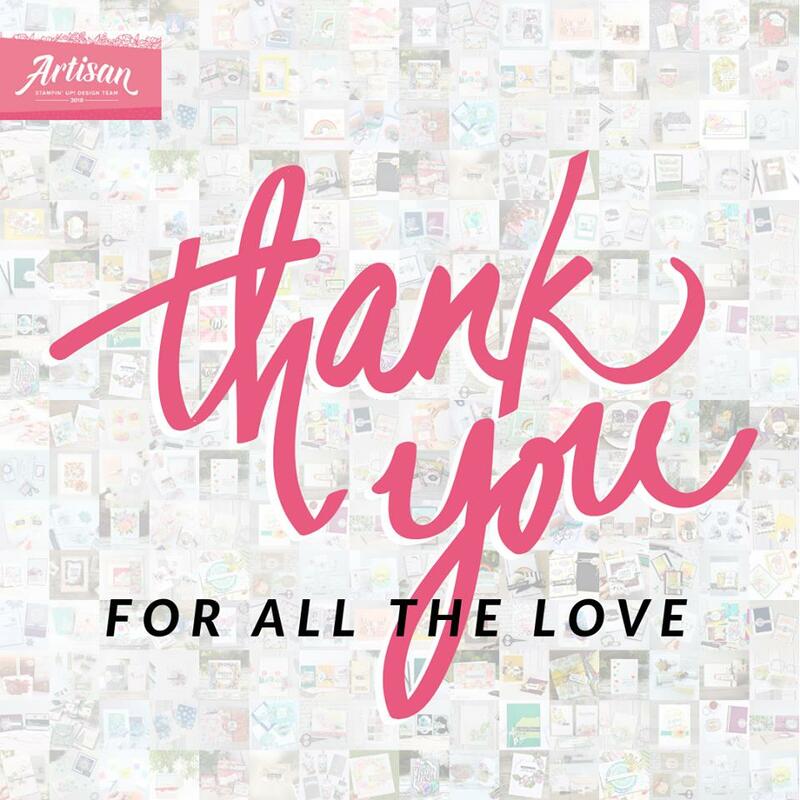 It is with a huge heart that I share my unending gratitude to Stampin' Up! for their generosity this year, They have trusted me to craft with their amazing products in my own style. ... and I did it my way! 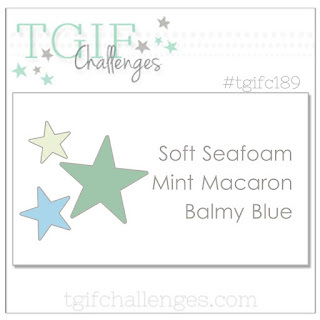 It's a cool and chilly color combo for this week's challenge at #TGIF189. I thought I would create a thank you card using the soft colors and just see where the process took me. My background is a mix of watercolor and graffiti. 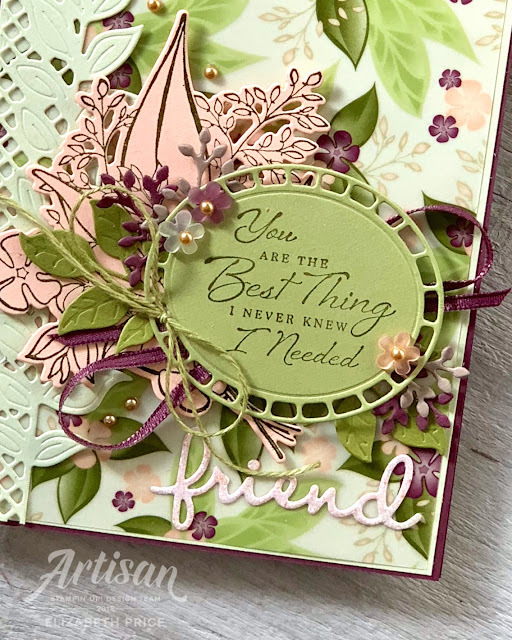 I blended all three challenge colors with and aquapainter and a stamp that says "you are the best." Once my background was dry I cut a Stitched Shapes large circle and popped it up with dimensionals. 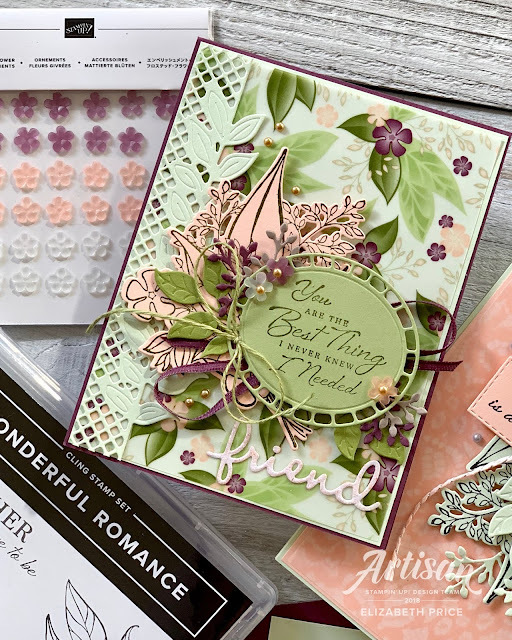 The "thank you" was cut using the Thank You Thinlits and the leaf and floral elements were cut with the Flourish Thinlits. 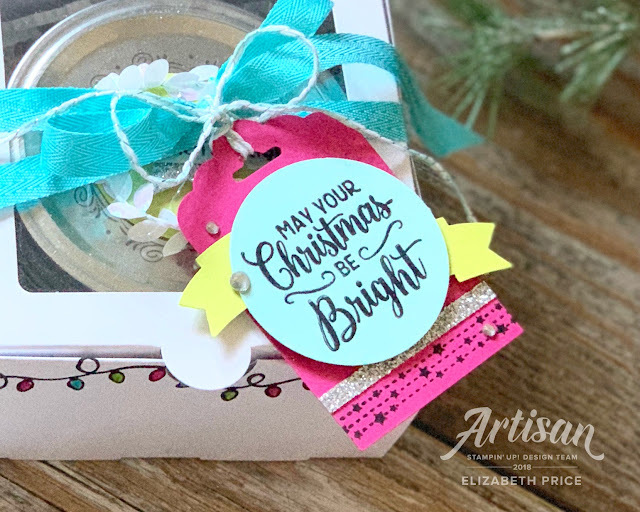 I couldn't resist throwing in some Sparkle Paper for an added bit of glitz and brightness. Sketches are always my most favorite of all challenges. They take me in a direction I would never have thought to go. 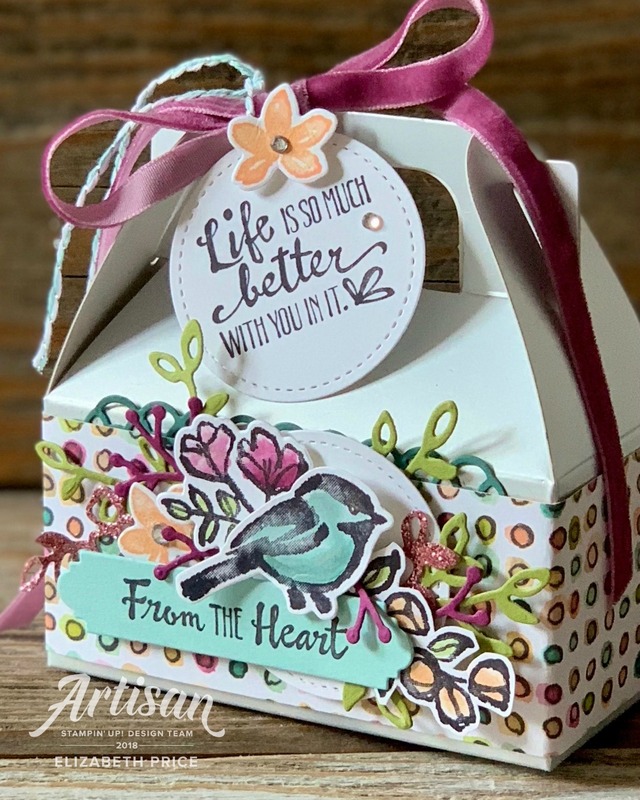 This cool challenge is being hosted today by Hand Stamped Sentiments. 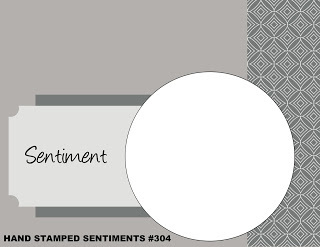 On a Silver Foil Edged Card I layered up the pieces for the sketch. 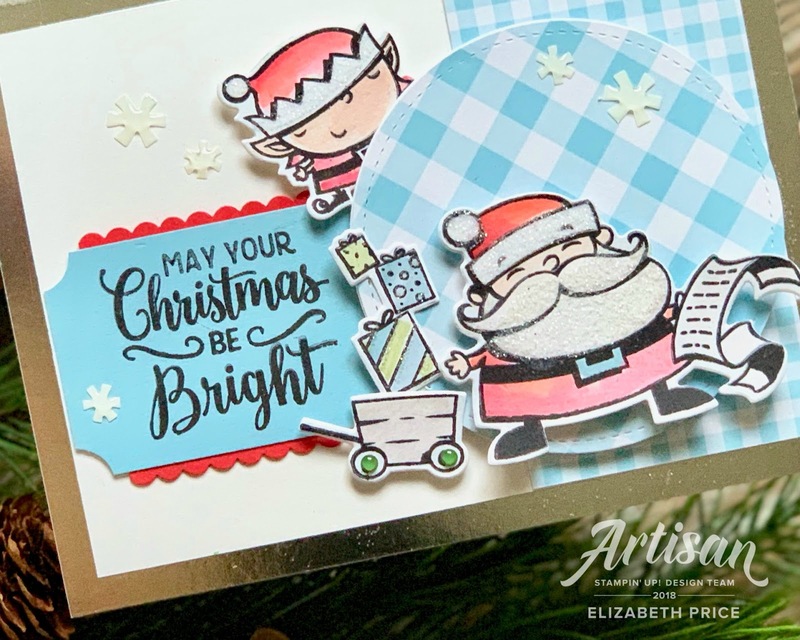 I worked with two stamp sets, Signs of Santa for the character images and Making Christmas Bright for the greeting. Everything is stamped with Jet Black Stazon Ink and watercolored with Balmy Blue, Poppy Parade, Petal Pink, Cherry Cobbler, and Grey Granite. 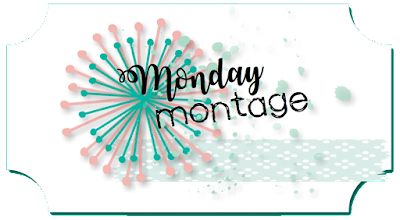 Hello stamp friends a welcome to our Monday Montage Blog Hop. For this hop I thought I would show you a super easy hand stamped Baker's Box and brightly colored coordinating tag. 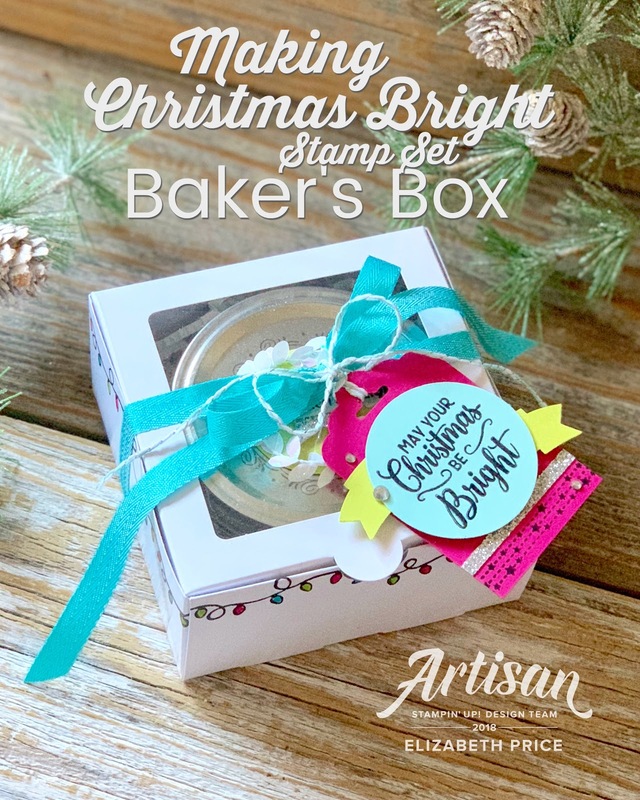 The Baker's Boxes found in the Holiday Catalog make for great goodie packaging. They are the perfect shape for the wide mouth 8 ounce canning jars. First I stamped the box with the Christmas light image from the Making Christmas Bright Stamp Set and a Jet Black Stazon Ink Pad. 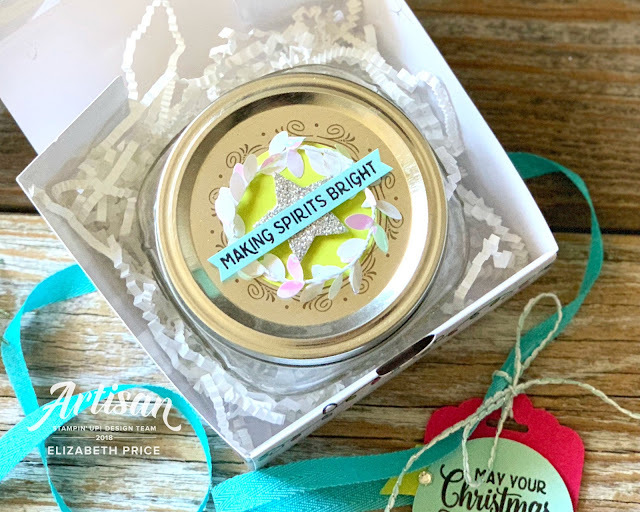 Once the ink was totally dry I colored the mini bulbs with Melon Mambo, Lemon Lime Twist, and Bermuda Bay Stampin' Write Markers. 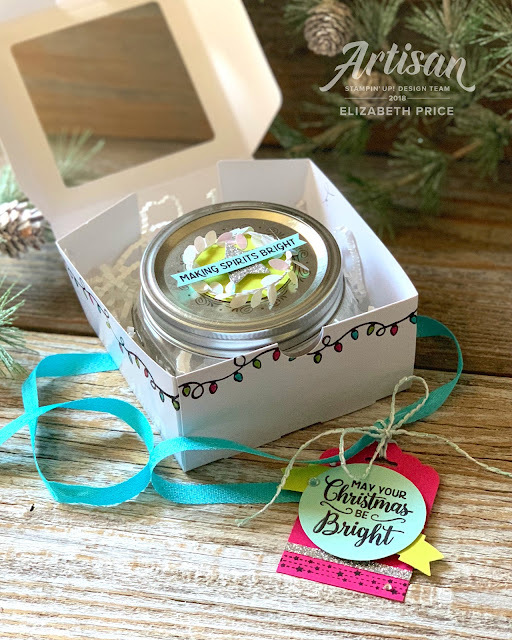 The canning jar lid is decorated with a 2" Lemon Lime Twist circle, an Iridescent Frosted Wreath Embellishment, and Silver Glimmer Paper star. I used a star die from the Woodcrate Framelits. It was a perfect size for what I was looking for. I simple Pool Party banner finishes the lid decor. I wish you all happy holiday crafting and packaging! Your next stop along the hop is with Julie or if you are working backwards, you will be visiting Dani. Welcome to our December Creation Station Blog Hop AND to two new Designer's for our team, Jeanna Bohanon and Dani Dziama! 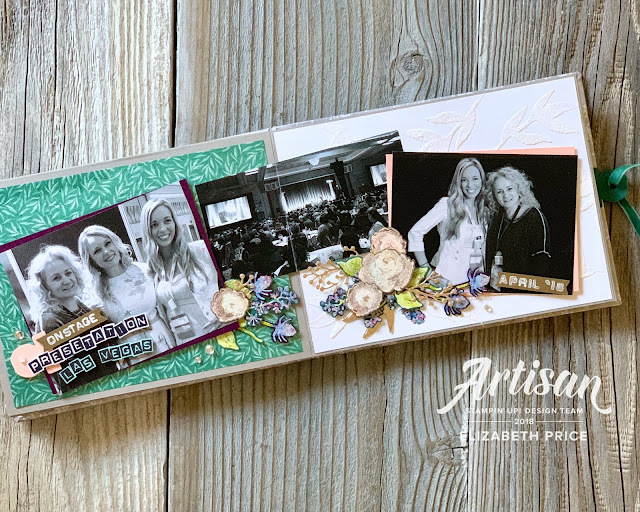 These two are incredible stampers and paper crafters and both have been members of the Artisan Design Team for Stampin' Up! 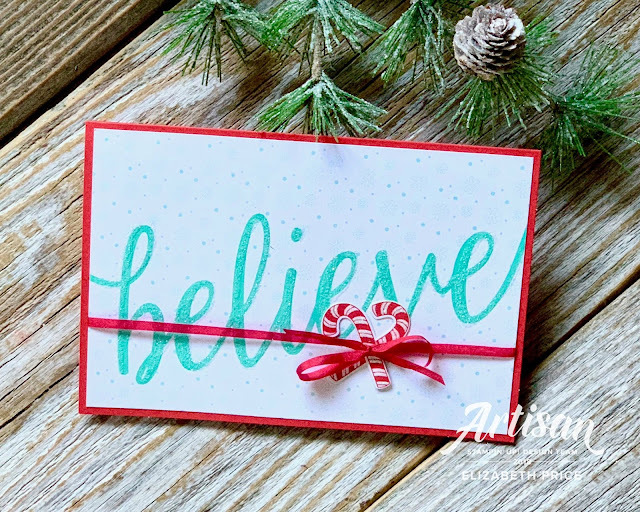 Our hop this month is all about "Celebrating the Season" and creating for what we celebrate this time of year. I welcome any holiday and love to learn about each. I also love giving. 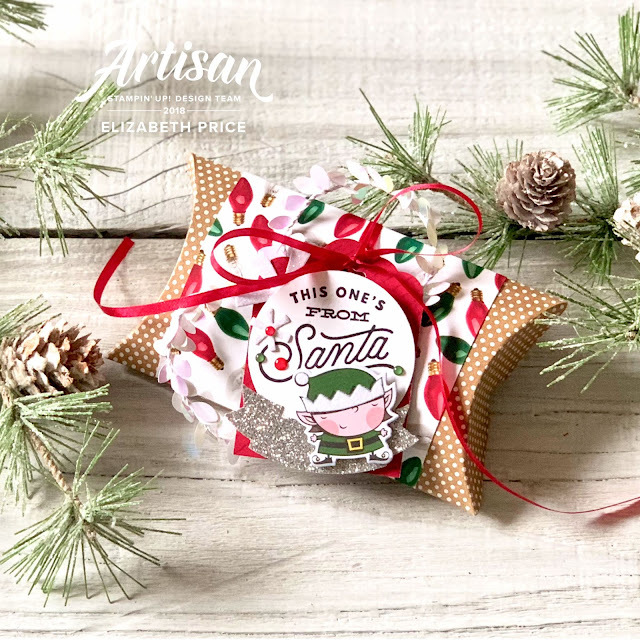 And when I give I want it to be packaged with just as much love as the gift itself. 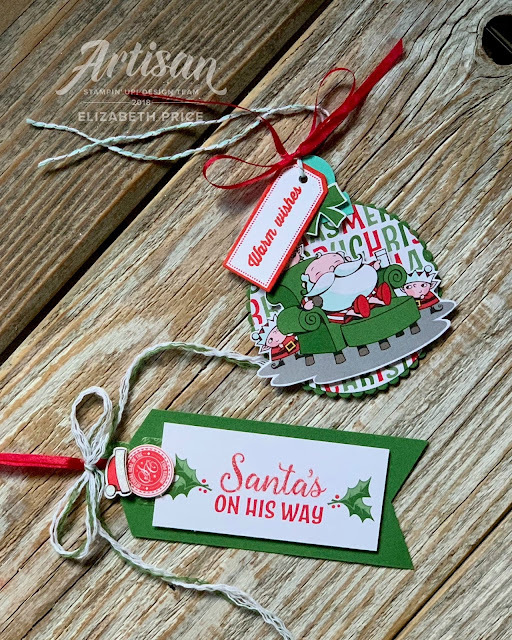 I am sharing another batch of gift tags featuring the Santa's Workshop Memories and More Card Pack and matching accessories. This "merry and bright" tag is so cute. Look close and you'll see the snowflake daisies at the top of the light bulb. So simple and so festive. Thanks for giving me a few moments to share what I love this season. 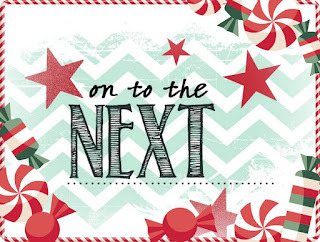 Now get ready for your next stop along our hop with the lovely Linda van Wely. We will all get to see how she celebrates this holiday season. 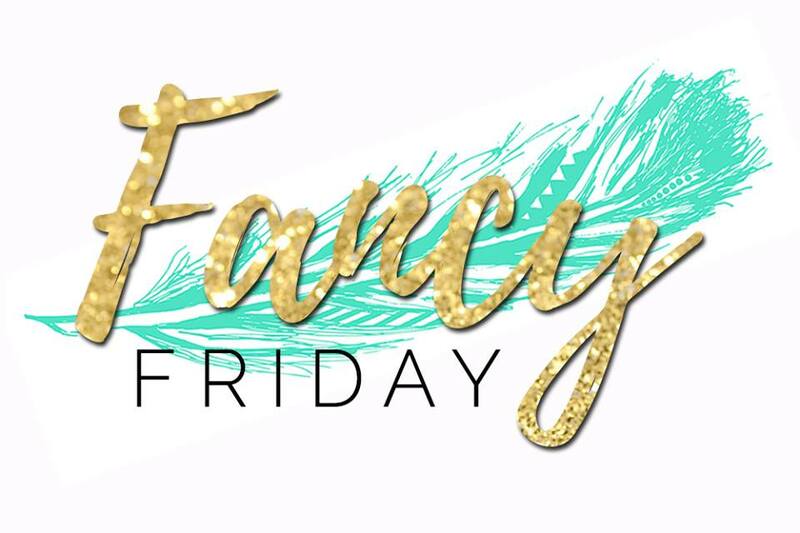 Join us for this "whatever you want" challenge at #TGIF188. It can be anything you want except a card. 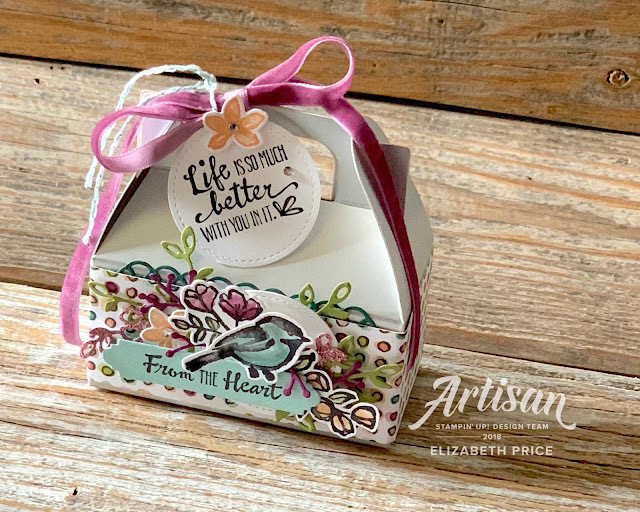 I thought I would share a gable box decorated all pretty ready to give to a friend. 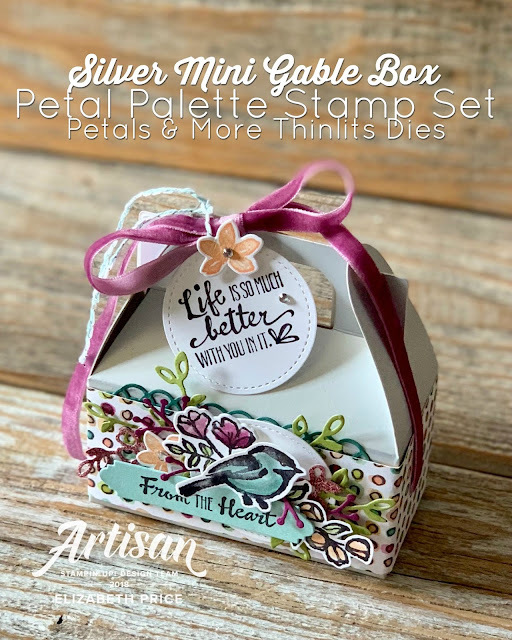 A wrap of Share What You Love DSP made for a quick way to add color to the Silver Mini Gable Box. 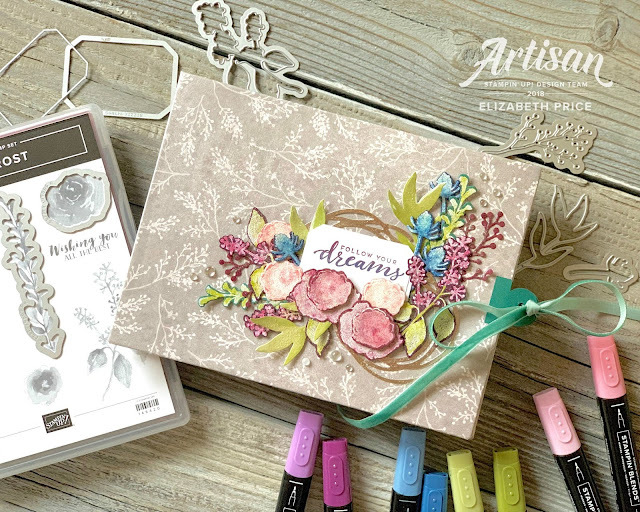 The colors in the paper became my palette for the bird, berries, flowers, and leaves. Next step was to stamp an array of a bunch of images on Whisper White with waterproof black ink. Once the ink was dry I watercolored each piece with a quick swoosh of ink using an AquaPainter. 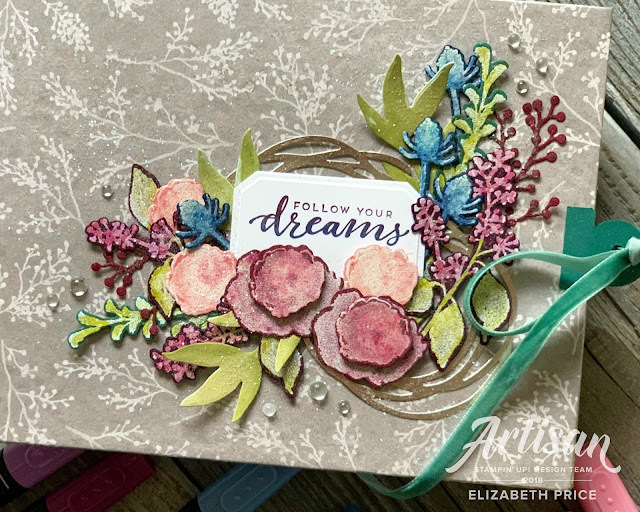 The Petals and More Thinlits match the stamp set perfectly, so no fussy cutting here, just me and the Big Shot was what I needed to cut everything out. 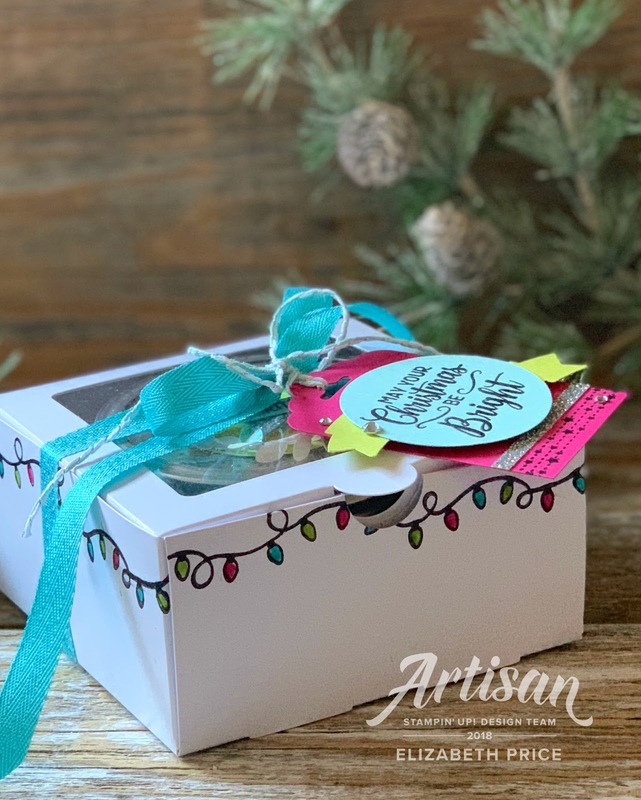 A long style shoestring bow tied with Rich Razzleberry Velvet Ribbon and Basic Rhinestones make the box extra fancy. The only other product I used was the Stitched Shapes Framelits to cut the two circles.